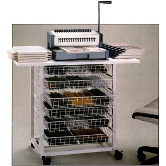 These carts keep your Binding Machines organized and streamline the process of any type of binding you may be doing. Spiral Coil Binding, Double Wire Loop, Plastic Comb, Velobind and others can be stored on these carts. All the corresponding supplies and accessories go in the same cart making your binding project that much more efficient. 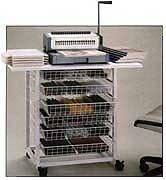 We also have Paper Stock Carts and trucks to store paper and make it easy to move around. 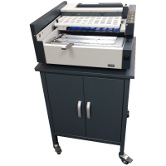 The paper stock carts vary in size and shelf amounts to fit any paper storing need you have. Organize your binding machine, accessories, and supplies in one location. This heavy-duty steel cart is designed to hold the PB2000T Perfect binder. An opening in the top aligns with the drain in the PB-2000T, making it easy to drain hot glue when needed.